I flew into Kinshasa with Leon, a Congolese trainer in the Alternatives to Violence Project (AVP). While waiting for two hours for my luggage, I was thrilled to have a young man ask if I was Bertha. 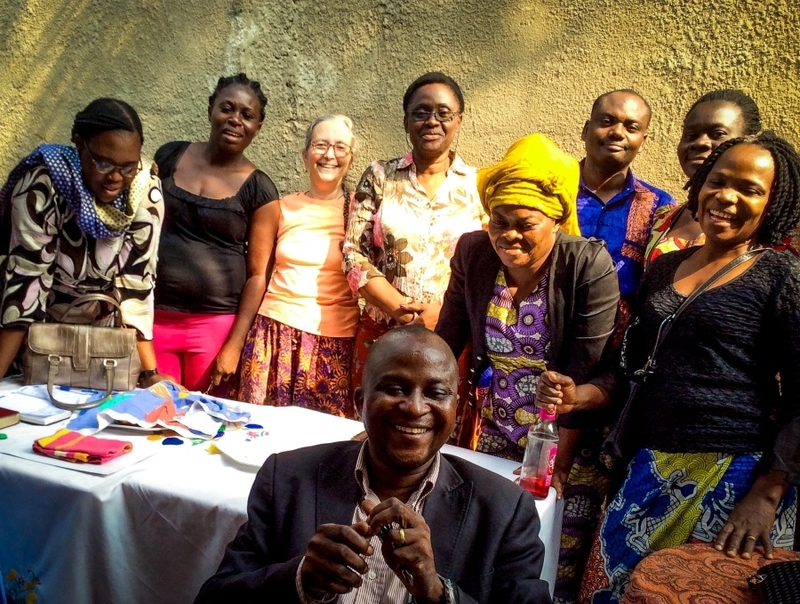 It was Johnny, from Kinshasa Monthly Meeting’s Project Muinda, which CFSC has supported for two decades. We finally emerged from the airport to be greeted by the founder of Project Muinda, Bakamana, and to be loaded into a waiting taxi. We were here to offer AVP training and another facilitator, Assumani, had arrived just before us, after almost missing his flight because they insisted on the details of the Canadian credit card CFSC had bought it with! Poor Assumani was half-sitting on me as we crammed into the taxi, and my first impression of Kinshasa was of hordes of people, and piles of refuse. We arrived and were kindly welcomed by the other members of the Muinda team – Marcel, Floribert, Deborah, and Ange. We realized that our communication had not been adequate, as Johnny and Bakamana had thought that we were coming to give one two-week long AVP workshop, and in fact we were coming to give two three-day workshops! Everything was quickly rearranged. We worked out who was supposed to do what for the AVP workshop and, while I was uneasy given that I am not yet a trained facilitator and had never done AVP in French, it worked quite well. There were more people coming in than we could accommodate, but happily we had the second workshop planned in a few days, so people could be put off to that one. There were a good number of women participants, and while some were shy, many were well spoken and participated fully. By 4 pm when we finished I was completely drained, but we had to do a lot of preparation for the next day. Over the next two days it was quite fascinating to watch some of the exercises evolve. I also had the chance to eat fried caterpillars, quite tasty and not bothersome if the origin is not pondered. The first round of AVP wrapped up successfully and everyone got their certificate of completion. After a day off we started the second AVP workshop. It was supposed to start at 8:30 am at the request of the participants, so that they could make their way back home before it was too late. But we had only a few people. However, in time more showed up and we eventually had a total of 27, which was ideal. I felt comfortable enough to take on a bit more than in the first workshop. Also, as we had already prepared materials, at the breaks I allowed myself the leisure to join others in the compound watching open air television for a World Cup soccer game. On the second day of the workshop there was a great deal of noise outside, what I later learned were whistles as students received news of success in their school-leaving exams. My ignorance of local customs made me fear initially that the constant whistling signaled some civil unrest or possible attack, so I was mightily relieved to learn it was the sound of joy! On Sunday we took a break from the workshop, so were able to enjoy Meeting for Worship with the small Muinda “family”. The times of quiet were most welcome, as was the spontaneous singing with communal heart-sprung joy which felt so far from my ken and so moving. Afterwards Marcel and his wife laid out an enormous number of products sewn by Action pour la Jeune Fille (AJF), a women’s vocational training project also supported by Kinshasa Monthly Meeting and CFSC. I saw many attractive bags of all sizes and a few stuffed animals, and when I said how much I planned to pay, they declared that I had just bought the lot. They proceeded to show how much they could compress into my spare suitcase! CFSC has these items for sale and all proceeds go back to AJF. Later in the afternoon I ventured out of the compound with Justin for a guided tour of the dishearteningly garbage-filled neighbourhood. We completed the second basic level AVP workshop, and all celebrated its successful conclusion. The next was another rest day. Leon and Assumani were gone with friends and relatives, and I spent the day inside, reading and knitting (an activity that was looked upon with amazement by my Congolese companions). TV reception was cut half an hour in advance of the World Cup semi-final, which I was told was the norm before an important match because bar owners bribe the power authority as a way to boost bar attendance! With our AVP workshops wrapped up, I had the chance to visit three of the Peace Cells that Muinda has trained with funding from CFSC. The first Peace Cell was one of the oldest, formed ten years ago, not long after the development of this particular area of the ever-expanding city, an area still without any electricity or water supply. The Cell has five key members and a number of others who come and go, usually disappointed that there is no honorarium for participation. They shared examples of disputes in which they have intervened, such as when, contrary to national law, a traditional matriarchal line of inheritance was being followed. A man had died, and all his land and possessions were to go to his nephew, while his children were expected to go back to the village of their mother. On discovering the situation and that the deceased in question had left several parcels of land, the Peace Cell was able to help negotiate the granting of one parcel to the man’s children to be able to survive at least for a while, giving them the time to decide how best to proceed, rather than being forced to flee abruptly to somewhere they did not know. The second Peace Cell we visited met in the quiet garden of the president, Adele. This is one of the newer Peace Cells, and is one emphasizing women’s participation (there were 10 women present, and 2 men, who were there “to give the male point of view”). They role-played a dispute and intervention for us to see. As it was in Lingala, I followed the body language. At 5 am Adele heard screaming on the street, and learned that when a man who had recently abandoned his wife and children was seen by his wife with another woman, she started to scream abuse at him and try to arouse support from bystanders. Adele intervened to hear her story and explain that this was not an appropriate way to address even a troublesome husband. The final Peace Cell we visited told me about a case where a child stole a cell phone and was taken by the phone’s owner to the police, where he was locked up for eleven days because the complainant did not return. This was far longer than permitted by law, and so the Peace Cell went to the magistrate to request the release of the child. The Peace Cell also visited the home of the phone’s owner, giving him a substitute phone to help convince him to reappear before the magistrate to support dropping the proceedings. The magistrate resisted these efforts, as he would get money for pursuing the case, but after long persuasion he agreed to release the child and drop charges without receiving his requested bribe. I heard these and many other stories of the ingenuity and persistence of the grassroots peace workers CFSC supports in this incredibly demanding context. I left exhausted but most impressed. Bertha Small, Ottawa Meeting, is the Clerk of CFSC’s peace committee. CFSC Communications Coordinator Matt Legge edited this article from a journal she wrote about her visit.